Available only to qualified customers at Mercedes-Benz of Temecula through Mercedes-Benz Financial Services at participating dealers through April 30, 2018. Not everyone will qualify. Advertised 36 months lease payment based on MSRP of $71,695 less the suggested dealer contribution resulting in a total gross capitalized cost of $69,308. Dealer contribution may vary and could affect your actual lease payment. Includes Destination Charge and Premium 1 Package. Excludes title, taxes, registration, license fees, insurance, dealer prep and additional options. Total monthly payments equal $30,925. Cash due at signing includes $5,953 capitalized cost reduction, $795 acquisition fee and first month’s lease payment of $859. Your acquisition fee may vary by dealership. The acquisition fee charged by the dealer may affect the total cash due at signing. No security deposit required. Total payments equal $30,924. At lease end, lessee pays for any amounts due under the lease, any official fees and taxes related to the scheduled termination, excess wear and use plus $0.25/mile over 30,000 miles, and $595 vehicle turn-in fee. Purchase option at lease end for $38,715 plus taxes (and any other fees and charges due under the applicable lease agreement) in example shown. Subject to credit approval. Specific vehicles are subject to availability and may have to be ordered. See participating dealer for details. Please always wear your seat belt, drive safely and obey speed limits. 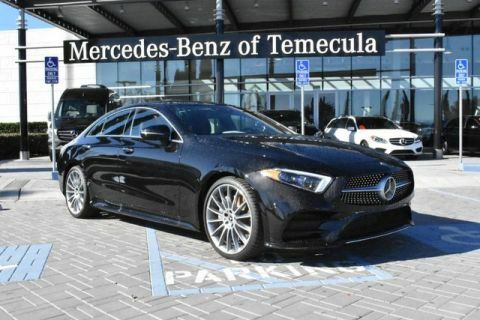 This 2019 Mercedes-Benz CLS CLS 450 is offered to you for sale by Mercedes-Benz of Temecula. This Mercedes-Benz includes: HIGH PERFORMANCE SUMMER TIRES Tires - Front All-Season Tires - Rear All-Season PREMIUM PACKAGE Keyless Start HD Radio Heated Front Seat(s) Satellite Radio Power Door Locks Keyless Entry REAR DECK SPOILER (PIO) Rear Spoiler BROWN ASH WOOD TRIM Woodgrain Interior Trim WHEELS: 20 AMG® MULTI-SPOKE Tires - Front All-Season Chrome Wheels Tires - Front Performance Aluminum Wheels Steel Wheels Tires - Rear Performance Tires - Rear All-Season WHEEL LOCKING BOLTS (PIO) Wheel Locks AMG® LINE Floor Mats BLIND SPOT ASSIST Blind Spot Monitor BLACK HEADLINER BURMESTER SURROUND SOUND SYSTEM Premium Sound System ILLUMINATED STAR (PIO) *Note - For third party subscriptions or services, please contact the dealer for more information. * Today's luxury vehicle is not just about opulence. It's about a perfect balance of performance, comfort and attention to detail. This 2019 Mercedes-Benz CLS is the perfect example of the modern luxury. This is about the time when you're saying it is too good to be true, and let us be the one's to tell you, it is absolutely true. This is the one. Just what you've been looking for. 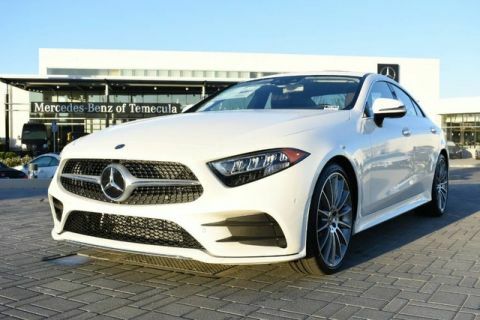 This 2019 Mercedes-Benz CLS CLS 450 is offered to you for sale by Mercedes-Benz of Temecula. This Mercedes-Benz includes: HIGH PERFORMANCE SUMMER TIRES Tires - Front All-Season Tires - Rear All-Season PREMIUM PACKAGE Keyless Start HD Radio Heated Front Seat(s) Satellite Radio Power Door Locks Keyless Entry REAR DECK SPOILER (PIO) Rear Spoiler SOFT-CLOSE DOORS WHEELS: 20 AMG® MULTI-SPOKE Tires - Front All-Season Chrome Wheels Tires - Front Performance Aluminum Wheels Steel Wheels Tires - Rear Performance Tires - Rear All-Season HEATED FRONT SEATS Heated Front Seat(s) AMG® LINE Floor Mats NATURAL GRAIN GREY ASH WOOD TRIM Woodgrain Interior Trim BLIND SPOT ASSIST Blind Spot Monitor BLACK HEADLINER PARKING ASSIST PACKAGE Automatic Parking Back-Up Camera *Note - For third party subscriptions or services, please contact the dealer for more information. * There's a level of quality and refinement in this Mercedes-Benz CLS that you won't find in your average vehicle. The Mercedes-Benz CLS CLS 450 will provide you with everything you have always wanted in a car -- Quality, Reliability, and Character. You can finally stop searching... You've found the one you've been looking for. 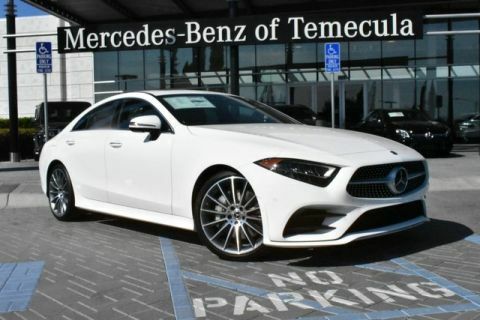 Mercedes-Benz of Temecula is excited to offer this 2019 Mercedes-Benz CLS. This Mercedes-Benz includes: HEATED & ACTIVE VENTILATED FRONT SEATS Cooled Front Seat(s) Heated Front Seat(s) ARRAY(0x156e0fb8) Keyless Start HD Radio Heated Front Seat(s) Satellite Radio Power Door Locks Keyless Entry REAR DECK SPOILER Rear Spoiler BEIGE HEADLINER ARRAY(0x156ddfa0) Tires - Front All-Season Chrome Wheels Tires - Front Performance Aluminum Wheels Steel Wheels Tires - Rear Performance Tires - Rear All-Season ARRAY(0x156e6460) 12.3 DIGITAL INSTRUMENT CLUSTER ARRAY(0x144a55e8) Floor Mats DESIGNO CARDINAL RED METALLIC ARRAY(0x156de330) Woodgrain Interior Trim BLIND SPOT ASSIST Blind Spot Monitor ILLUMINATED DOOR SILLS W/MERCEDES-BENZ LETTERING *Note - For third party subscriptions or services, please contact the dealer for more information. * The look is unmistakably Mercedes-Benz, the smooth contours and cutting-edge technology of this Mercedes-Benz CLS CLS 450 will definitely turn heads. The Mercedes-Benz CLS CLS 450 will provide you with everything you have always wanted in a car -- Quality, Reliability, and Character. You can finally stop searching... You've found the one you've been looking for. Contact Mercedes-Benz of Temecula today for information on dozens of vehicles like this 2019 Mercedes-Benz CLS CLS 450. This Mercedes-Benz includes: HIGH PERFORMANCE SUMMER TIRES Tires - Front All-Season Tires - Rear All-Season HEATED & ACTIVE VENTILATED FRONT SEATS Cooled Front Seat(s) Heated Front Seat(s) HEAD-UP DISPLAY Heads-Up Display REAR DECK SPOILER (PIO) Rear Spoiler BROWN ASH WOOD TRIM Woodgrain Interior Trim WHEELS: 20 AMG® MULTI-SPOKE Tires - Front All-Season Chrome Wheels Tires - Front Performance Aluminum Wheels Steel Wheels Tires - Rear Performance Tires - Rear All-Season 12.3 DIGITAL INSTRUMENT CLUSTER BLACK HEADLINER PARKING ASSIST PACKAGE Automatic Parking Back-Up Camera ILLUMINATED DOOR SILLS W/MERCEDES-BENZ LETTERING BURMESTER SURROUND SOUND SYSTEM Premium Sound System ILLUMINATED STAR (PIO) *Note - For third party subscriptions or services, please contact the dealer for more information. * Pull up in the vehicle and the valet will want to parked on the front row. This Mercedes-Benz CLS is the vehicle others dream to own. Don't miss your chance to make it your new ride. Look no further, you have found exactly what you've been looking for. This is about the time when you're saying it is too good to be true, and let us be the one's to tell you, it is absolutely true. 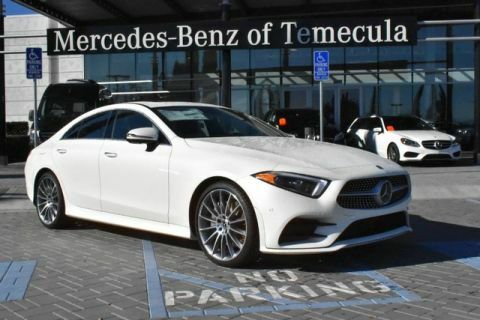 This 2019 Mercedes-Benz CLS CLS 450 is proudly offered by Mercedes-Benz of Temecula This Mercedes-Benz includes: HIGH PERFORMANCE SUMMER TIRES Tires - Front All-Season Tires - Rear All-Season PRE-WIRING FOR RR SEAT ENT REAR DECK SPOILER (PIO) Rear Spoiler WHEELS: 20 AMG® MULTI-SPOKE Tires - Front All-Season Chrome Wheels Tires - Front Performance Aluminum Wheels Steel Wheels Tires - Rear Performance Tires - Rear All-Season HEATED FRONT SEATS Heated Front Seat(s) 12.3 DIGITAL INSTRUMENT CLUSTER AMG® LINE Floor Mats NATURAL GRAIN GREY ASH WOOD TRIM Woodgrain Interior Trim BLACK HEADLINER PARKING ASSIST PACKAGE Automatic Parking Back-Up Camera ILLUMINATED DOOR SILLS W/MERCEDES-BENZ LETTERING BURMESTER SURROUND SOUND SYSTEM Premium Sound System *Note - For third party subscriptions or services, please contact the dealer for more information. * You deserve a vehicle designed for higher expectations. This Mercedes-Benz CLS delivers with a luxurious, well-appointed interior and world-class engineering. The Mercedes-Benz CLS CLS 450 will provide you with everything you have always wanted in a car -- Quality, Reliability, and Character. Beautiful color combination with Designo Cardinal Red Metallic exterior over Black interior making this the one to own! 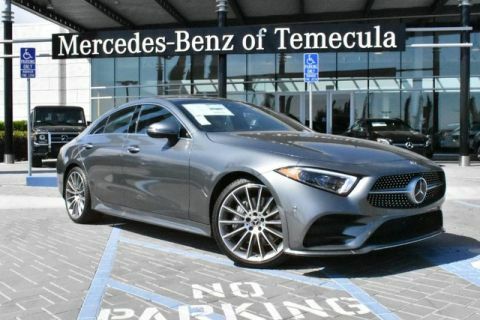 This 2019 Mercedes-Benz CLS CLS 450 is offered to you for sale by Mercedes-Benz of Temecula. This Mercedes-Benz includes: HIGH PERFORMANCE SUMMER TIRES Tires - Front All-Season Tires - Rear All-Season PRE-WIRING FOR RR SEAT ENT PREMIUM PACKAGE Keyless Start HD Radio Heated Front Seat(s) Satellite Radio Power Door Locks Keyless Entry BROWN ASH WOOD TRIM Woodgrain Interior Trim BEIGE HEADLINER SOFT-CLOSE DOORS WHEELS: 20 AMG® MULTI-SPOKE Tires - Front All-Season Chrome Wheels Tires - Front Performance Aluminum Wheels Steel Wheels Tires - Rear Performance Tires - Rear All-Season WHEEL LOCKING BOLTS (PIO) Wheel Locks HEATED FRONT SEATS Heated Front Seat(s) AMG® LINE Floor Mats DRIVER ASSISTANCE PACKAGE Lane Departure Warning Lane Keeping Assist Brake Assist Adaptive Cruise Control PARKING ASSIST PACKAGE Automatic Parking Back-Up Camera ILLUMINATED DOOR SILLS W/MERCEDES-BENZ LETTERING BURMESTER SURROUND SOUND SYSTEM Premium Sound System *Note - For third party subscriptions or services, please contact the dealer for more information. * You deserve a vehicle designed for higher expectations. This Mercedes-Benz CLS delivers with a luxurious, well-appointed interior and world-class engineering. Beautiful color combination with Dakota Brown Metallic exterior over Macchiato Beige/Brown interior making this the one to own! This is the one. Just what you've been looking for. 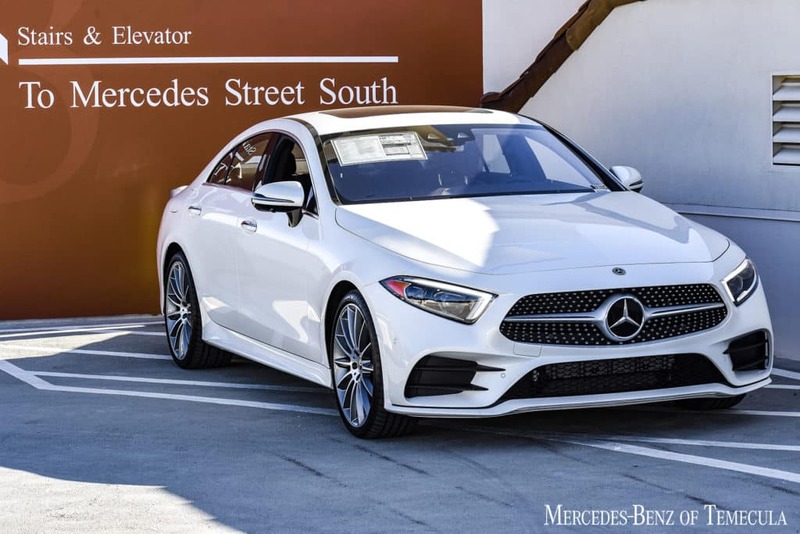 Contact Mercedes-Benz of Temecula today for information on dozens of vehicles like this 2019 Mercedes-Benz CLS CLS 450. This Mercedes-Benz includes: HEATED & ACTIVE VENTILATED FRONT SEATS Cooled Front Seat(s) Heated Front Seat(s) REAR DECK SPOILER (PIO) Rear Spoiler BROWN ASH WOOD TRIM Woodgrain Interior Trim WHEELS: 20 AMG® MULTI-SPOKE Tires - Front All-Season Chrome Wheels Tires - Front Performance Aluminum Wheels Steel Wheels Tires - Rear Performance Tires - Rear All-Season ENERGIZING COMFORT PACKAGE 12.3 DIGITAL INSTRUMENT CLUSTER AMG® LINE Floor Mats DRIVER ASSISTANCE PACKAGE Lane Departure Warning Lane Keeping Assist Brake Assist Adaptive Cruise Control BLACK HEADLINER PARKING ASSIST PACKAGE Automatic Parking Back-Up Camera ILLUMINATED DOOR SILLS W/MERCEDES-BENZ LETTERING *Note - For third party subscriptions or services, please contact the dealer for more information. * You appreciate the finer things in life, the vehicle you drive should not be the exception. Style, performance, sophistication is in a class of its own with this stunning Mercedes-Benz CLS. This is about the time when you're saying it is too good to be true, and let us be the one's to tell you, it is absolutely true. You can finally stop searching... You've found the one you've been looking for. 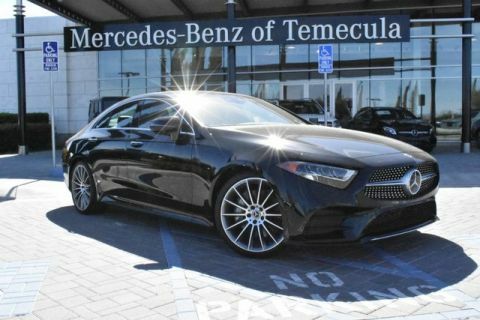 This outstanding example of a 2019 Mercedes-Benz CLS CLS 450 is offered by Mercedes-Benz of Temecula. This Mercedes-Benz includes: HIGH PERFORMANCE SUMMER TIRES Tires - Front All-Season Tires - Rear All-Season PRE-WIRING FOR RR SEAT ENT PREMIUM PACKAGE Keyless Start HD Radio Heated Front Seat(s) Satellite Radio Power Door Locks Keyless Entry BROWN ASH WOOD TRIM Woodgrain Interior Trim FRONT SEATS RAPID-HEATING FUNCTIONALITY Split Bench Seat Heated Front Seat(s) Fixed Bench Seat Bucket Seats SOFT-CLOSE DOORS ENERGIZING COMFORT PACKAGE 12.3 DIGITAL INSTRUMENT CLUSTER AMG® LINE Floor Mats DRIVER ASSISTANCE PACKAGE Lane Departure Warning Lane Keeping Assist Brake Assist Adaptive Cruise Control BLACK HEADLINER PARKING ASSIST PACKAGE Automatic Parking Back-Up Camera ILLUMINATED DOOR SILLS W/MERCEDES-BENZ LETTERING BURMESTER SURROUND SOUND SYSTEM Premium Sound System *Note - For third party subscriptions or services, please contact the dealer for more information. * There's a level of quality and refinement in this Mercedes-Benz CLS that you won't find in your average vehicle. 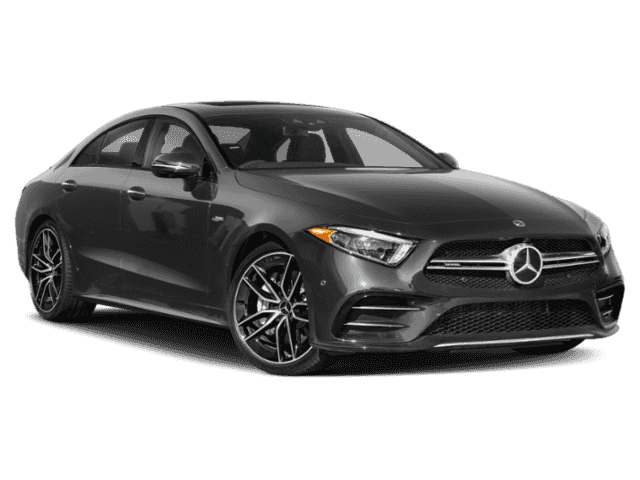 The 2019 Mercedes-Benz exterior is finished in a breathtaking Black, while being complemented by such a gorgeous Black interior. This color combination is stunning and absolutely beautiful! Just what you've been looking for. With quality in mind, this vehicle is the perfect addition to take home. 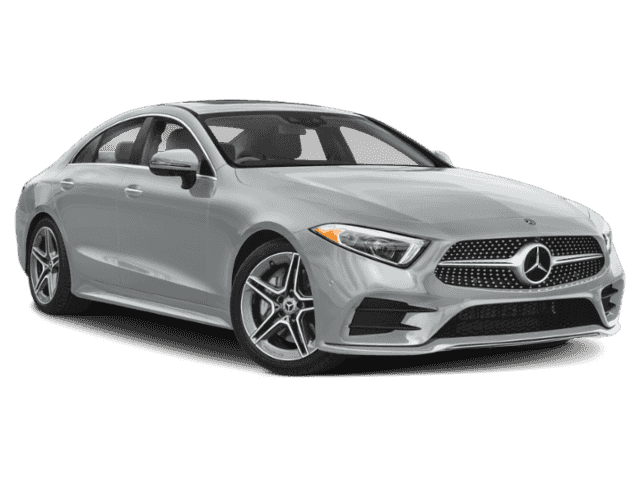 Contact Mercedes-Benz of Temecula today for information on dozens of vehicles like this 2019 Mercedes-Benz CLS CLS 450. This Mercedes-Benz includes: HIGH PERFORMANCE SUMMER TIRES Tires - Front All-Season Tires - Rear All-Season PREMIUM PACKAGE Keyless Start HD Radio Heated Front Seat(s) Satellite Radio Power Door Locks Keyless Entry 115V AC POWER OUTLET ENERGIZING COMFORT PACKAGE 12.3 DIGITAL INSTRUMENT CLUSTER AMG® LINE Floor Mats NATURAL GRAIN GREY ASH WOOD TRIM Woodgrain Interior Trim ACTIVE MULTICONTOUR FRONT SEATS W/MASSAGE FEATURE Seat-Massage Split Bench Seat Power Passenger Seat Power Driver Seat Fixed Bench Seat Bucket Seats DRIVER ASSISTANCE PACKAGE Lane Departure Warning Lane Keeping Assist Brake Assist Adaptive Cruise Control BLACK HEADLINER PARKING ASSIST PACKAGE Automatic Parking Back-Up Camera ILLUMINATED DOOR SILLS W/MERCEDES-BENZ LETTERING BURMESTER SURROUND SOUND SYSTEM Premium Sound System *Note - For third party subscriptions or services, please contact the dealer for more information. * You appreciate the finer things in life, the vehicle you drive should not be the exception. Style, performance, sophistication is in a class of its own with this stunning Mercedes-Benz CLS. Beautiful color combination with Selenite Grey Metallic exterior over Magma Grey/Espresso Brown interior making this the one to own! This is the one. Just what you've been looking for. Contact Mercedes-Benz of Temecula today for information on dozens of vehicles like this 2019 Mercedes-Benz CLS CLS 450. This Mercedes-Benz includes: HEATED & ACTIVE VENTILATED FRONT SEATS Cooled Front Seat(s) Heated Front Seat(s) PRE-WIRING FOR RR SEAT ENT LIGHT BROWN SEN WOOD TRIM Woodgrain Interior Trim HEAD-UP DISPLAY Heads-Up Display PREMIUM PACKAGE Keyless Start HD Radio Heated Front Seat(s) Satellite Radio Power Door Locks Keyless Entry REAR DECK SPOILER (PIO) Rear Spoiler FRONT SEATS RAPID-HEATING FUNCTIONALITY Split Bench Seat Heated Front Seat(s) Fixed Bench Seat Bucket Seats SOFT-CLOSE DOORS ENERGIZING COMFORT PACKAGE ACTIVE MULTICONTOUR FRONT SEATS W/MASSAGE FEATURE Seat-Massage Split Bench Seat Power Passenger Seat Power Driver Seat Fixed Bench Seat Bucket Seats DRIVER ASSISTANCE PACKAGE Lane Departure Warning Lane Keeping Assist Brake Assist Adaptive Cruise Control PARKING ASSIST PACKAGE Automatic Parking Back-Up Camera ILLUMINATED DOOR SILLS W/MERCEDES-BENZ LETTERING BURMESTER SURROUND SOUND SYSTEM Premium Sound System *Note - For third party subscriptions or services, please contact the dealer for more information. * You appreciate the finer things in life, the vehicle you drive should not be the exception. Style, performance, sophistication is in a class of its own with this stunning Mercedes-Benz CLS. There is no reason why you shouldn't buy this Mercedes-Benz CLS CLS 450. It is incomparable for the price and quality. The look is unmistakably Mercedes-Benz, the smooth contours and cutting-edge technology of this Mercedes-Benz CLS CLS 450 will definitely turn heads. 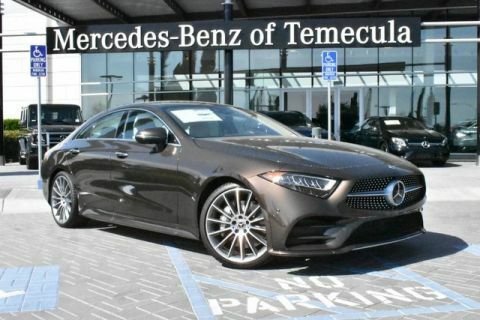 You can find this 2019 Mercedes-Benz CLS CLS 450 and many others like it at Mercedes-Benz of Temecula. This Mercedes-Benz includes: HIGH PERFORMANCE SUMMER TIRES Tires - Front All-Season Tires - Rear All-Season HEATED & ACTIVE VENTILATED FRONT SEATS Cooled Front Seat(s) Heated Front Seat(s) PRE-WIRING FOR RR SEAT ENT & COMFORT ADAPTER ARRAY(0x156e0fb8) Keyless Start HD Radio Heated Front Seat(s) Satellite Radio Power Door Locks Keyless Entry FRONT SEATS RAPID-HEATING FUNCTIONALITY Split Bench Seat Heated Front Seat(s) Fixed Bench Seat Bucket Seats SOFT-CLOSE DOORS ARRAY(0x156ddfa0) Tires - Front All-Season Chrome Wheels Tires - Front Performance Aluminum Wheels Steel Wheels Tires - Rear Performance Tires - Rear All-Season ARRAY(0x156e6460) WHEEL LOCKING BOLTS Wheel Locks ARRAY(0x156e40c0) ARRAY(0x144a55e8) Floor Mats DESIGNO CARDINAL RED METALLIC ARRAY(0x156de330) Woodgrain Interior Trim ARRAY(0x156ddc88) Lane Departure Warning Lane Keeping Assist Brake Assist Adaptive Cruise Control BLACK HEADLINER ILLUMINATED DOOR SILLS W/MERCEDES-BENZ LETTERING BURMESTER SURROUND SOUND SYSTEM Premium Sound System *Note - For third party subscriptions or services, please contact the dealer for more information. * This is about the time when you're saying it is too good to be true, and let us be the one's to tell you, it is absolutely true. Just what you've been looking for. With quality in mind, this vehicle is the perfect addition to take home. Beautiful color combination with Selenite Grey Metallic exterior over Magma Grey/Espresso Brown interior making this the one to own! 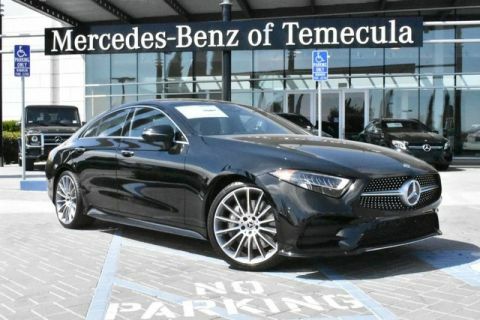 This 2019 Mercedes-Benz CLS CLS 450 is offered to you for sale by Mercedes-Benz of Temecula. This Mercedes-Benz includes: HIGH PERFORMANCE SUMMER TIRES Tires - Front All-Season Tires - Rear All-Season NATURAL GRAIN LIGHT BROWN ELM WOOD TRIM Woodgrain Interior Trim PRE-WIRING FOR RR SEAT ENT PREMIUM PACKAGE Keyless Start HD Radio Heated Front Seat(s) Satellite Radio Power Door Locks Keyless Entry BEIGE HEADLINER ENERGIZING COMFORT PACKAGE 12.3 DIGITAL INSTRUMENT CLUSTER EXTERIOR LIGHTING PACKAGE AMG® LINE Floor Mats POWER REAR-WINDOW SUNSHADE ACTIVE MULTICONTOUR FRONT SEATS W/MASSAGE FEATURE Seat-Massage Split Bench Seat Power Passenger Seat Power Driver Seat Fixed Bench Seat Bucket Seats DRIVER ASSISTANCE PACKAGE Lane Departure Warning Lane Keeping Assist Brake Assist Adaptive Cruise Control PARKING ASSIST PACKAGE Automatic Parking Back-Up Camera ILLUMINATED DOOR SILLS W/MERCEDES-BENZ LETTERING BURMESTER SURROUND SOUND SYSTEM Premium Sound System *Note - For third party subscriptions or services, please contact the dealer for more information. * Pull up in the vehicle and the valet will want to parked on the front row. This Mercedes-Benz CLS is the vehicle others dream to own. Don't miss your chance to make it your new ride. You can finally stop searching... You've found the one you've been looking for. This is about the time when you're saying it is too good to be true, and let us be the one's to tell you, it is absolutely true. 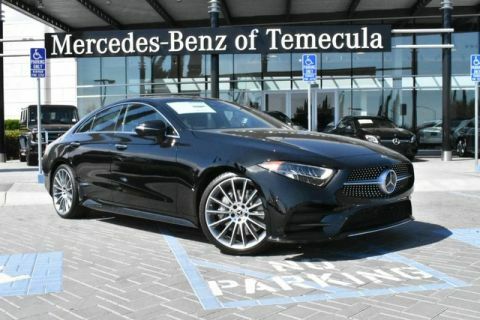 You can find this 2019 Mercedes-Benz CLS CLS 450 and many others like it at Mercedes-Benz of Temecula. This Mercedes-Benz includes: HEATED & ACTIVE VENTILATED FRONT SEATS Cooled Front Seat(s) Heated Front Seat(s) REAR DECK SPOILER (PIO) Rear Spoiler FRONT SEATS RAPID-HEATING FUNCTIONALITY Split Bench Seat Heated Front Seat(s) Fixed Bench Seat Bucket Seats WHEELS: 20 AMG® MULTI-SPOKE Tires - Front All-Season Chrome Wheels Tires - Front Performance Aluminum Wheels Steel Wheels Tires - Rear Performance Tires - Rear All-Season ENERGIZING COMFORT PACKAGE 12.3 DIGITAL INSTRUMENT CLUSTER AMG® LINE Floor Mats NATURAL GRAIN GREY ASH WOOD TRIM Woodgrain Interior Trim ACTIVE MULTICONTOUR FRONT SEATS W/MASSAGE FEATURE Seat-Massage Split Bench Seat Power Passenger Seat Power Driver Seat Fixed Bench Seat Bucket Seats DRIVER ASSISTANCE PACKAGE Lane Departure Warning Lane Keeping Assist Brake Assist Adaptive Cruise Control PARKING ASSIST PACKAGE Automatic Parking Back-Up Camera ILLUMINATED DOOR SILLS W/MERCEDES-BENZ LETTERING BURMESTER SURROUND SOUND SYSTEM Premium Sound System *Note - For third party subscriptions or services, please contact the dealer for more information. * You appreciate the finer things in life, the vehicle you drive should not be the exception. Style, performance, sophistication is in a class of its own with this stunning Mercedes-Benz CLS. You can finally stop searching... You've found the one you've been looking for. Just what you've been looking for. With quality in mind, this vehicle is the perfect addition to take home. Contact Mercedes-Benz of Temecula today for information on dozens of vehicles like this 2019 Mercedes-Benz CLS CLS 450. This Mercedes-Benz includes: HIGH PERFORMANCE SUMMER TIRES Tires - Front All-Season Tires - Rear All-Season PRE-WIRING FOR RR SEAT ENT PREMIUM PACKAGE Keyless Start HD Radio Heated Front Seat(s) Satellite Radio Power Door Locks Keyless Entry REAR DECK SPOILER (PIO) Rear Spoiler SOFT-CLOSE DOORS DESIGNO BLACK/TITANIUM GREY PEARL LEATHER PACKAGE Vinyl Seats Cloth Seats Floor Mats Leather Seats Premium Synthetic Seats WHEELS: 20 AMG® MULTI-SPOKE Tires - Front All-Season Chrome Wheels Tires - Front Performance Aluminum Wheels Steel Wheels Tires - Rear Performance Tires - Rear All-Season WHEEL LOCKING BOLTS (PIO) Wheel Locks 12.3 DIGITAL INSTRUMENT CLUSTER ACOUSTIC COMFORT PACKAGE EXTERIOR LIGHTING PACKAGE AMG® LINE Floor Mats PARKING ASSIST PACKAGE Automatic Parking Back-Up Camera ILLUMINATED DOOR SILLS W/MERCEDES-BENZ LETTERING WARMTH & COMFORT PACKAGE Split Bench Seat Heated Steering Wheel Heated Front Seat(s) Fixed Bench Seat Bucket Seats BURMESTER SURROUND SOUND SYSTEM Premium Sound System *Note - For third party subscriptions or services, please contact the dealer for more information. * Pull up in the vehicle and the valet will want to parked on the front row. This Mercedes-Benz CLS is the vehicle others dream to own. Don't miss your chance to make it your new ride. This is about the time when you're saying it is too good to be true, and let us be the one's to tell you, it is absolutely true. This is the one. Just what you've been looking for. Contact Mercedes-Benz of Temecula today for information on dozens of vehicles like this 2019 Mercedes-Benz CLS AMG® CLS 53 S. This Mercedes-Benz includes: EDITION 1 Seat-Massage Heated Rear Seat(s) Tires - Front All-Season Lane Departure Warning Tires - Front Performance Cooled Front Seat(s) Aluminum Wheels Lane Keeping Assist Heated Steering Wheel Brake Assist Adaptive Cruise Control Power Passenger Seat Floor Mats Power Driver Seat Heated Front Seat(s) Tires - Rear Performance Heads-Up Display Bucket Seats Tires - Rear All-Season *Note - For third party subscriptions or services, please contact the dealer for more information. * You deserve a vehicle designed for higher expectations. This Mercedes-Benz CLS delivers with a luxurious, well-appointed interior and world-class engineering. Once you see this Mercedes-Benz, you'll quickly see that this is the perfect vehicle for the outdoor junky! You'll even feel relaxed knowing that this All-Wheel drive vehicle will get you to where you are going no matter what may come your way. Also, with this Mercedes-Benz CLS's dependable control you'll be able to drive into the sunset without a care in the world!